What is the meaning of the Gardens of the Righteous? What purpose do they serve? Why do we build them? This is the question, which we all need to address in our meeting today. I imagine the Gardens as a permanent critical conscience for our society. In any political context, either with the left or the right wing on power, both if we like and if we dislike the government, they should become thought places, able to confront the public with new questions every time. The Gardens have no political colouring and can play a positive role both in the direst straits of humanity and when the world seems to head for the wrong direction. There is nothing granted in fact, even in the most perfect society. What is the original mechanism that makes them stand out of other remembrance places of the same importance? They are a place of continuing education through the promotion of the best examples in humanity, places for reflection and meditation. Not only monumental places for remembrance and commemoration, but also stimuli to take up responsibility in the time we live in. This is the novelty. We plant trees, not only to give them a name, to connect a face with a man or a woman, but because these Righteous summon us to act. Planting a tree means bringing back these people to live with our behaviour. It is the only possible resurrection on our earth. Those who have sown some Good, we revive them through our deeds. By naming a tree after somebody we pick the baton of those who have fought in the past and we assume a responsibility in our existence. This is why it is important to start always from an analysis of our time. Every time faces its own challenges in terms of responsibility. Moral behaviours are never the same in all times, as the Good and the Evil always have different features. As Heraclitus used to say: the water of the rivers always changes. We, over these 20 years since the birth of Gariwo, have reached two major goals in our history. We have empowered the Memory of the Good, trying to show the individual’s possibility under any circumstances, even the direst ones, to behave righteously. The Righteous, as father Barbareschi reminded us, is the loftiest expression of our love of freedom, because they, with their own personalities, never bow their head in the face of dictatorships or persecutions against human beings. We then universalized the idea of Righteousness, extending it from the Holocaust to all cases of totalitarianism and genocide, because those who act for Good do so for the entire humankind. This was the message of my mentor Moshe Bejski, who not by chance called the Righteous as the true moral élite that holds in its hands the fate of the entire world. Today, we are summoned to accomplished a third little revolution: make the Gardens a stimulus to create some good practices and exemplary behaviours in society, as Ulianova Radice passionately believed. We must create a cultural life all around the Gardens, that be able to stem the culture of hate and contempt in the political debate; to create forms of interaction and conciliation between different faiths and cultures; to teach the young people the taste of dialogue on the social networks, spreading the knowledge, culture and the good reading habits, and rejecting personal slurs and the logics of enmity. Immanuel Kant said it well, as he put forward the pleasure of conversation among different people seeking the common Good. We are all summoned to find again the taste of our common European fate, as Milena Jesenska, Kafka’s beloved woman, would say in the Thirties, after the Munich Pact, which led the Nazis to Prague, thwarting any nationalist, potentially warmongering anathema. Milena saw the suicide and catastrophe of Europe. We must avert it. The Gardens of the Righteous are the privileged place of education to peace and women’s and human rights altogether in every corner of the earth. We can define them as an imaginary city that may challenge people to think and overcome any kind of prejudice and barrier that divides us from the others. Unfortunately, I must say I also drew a bitter lesson from history. Remembrance remains something idle unless it generates new behaviours. It is all too easy to declare yourself on the right side when confronted with the Nazi past and says you feel compassion toward the Jews and the persecuted, and then become indifferent to what happens around us. Remembrance is not an antidote to evil unless we are ready to change and listen to the others. This is thus the great originality of the Gardens, that should inspire new behaviours. This is why we at Gariwo have drawn inspiration from the experience of Charta ’77, in which Jan Patocka and Vaclav Havel invited the citizens from Prague to respond to conformism and willing serfdom by a direct assumption of responsibility for their daily life. They did not only sign a document of support to some ethical principles but also personally committed to becoming players of new, good practices in society. But what kind of times are we living today? My generation has seen, at least in Europe, the end of wars, the defeat of the communist regimes, the growth in the freedom and rights and the hope in a shared world. It somehow seemed an unstoppable march toward what we could conjure up as a cosmopolitan horizon and the strengthening of the supranational institutions to face the challenges of our time, first of all, climate change. And instead, today, the economic crisis, the great problems of migrations, the inequalities caused by globalization, are triggering a return to nationalism, ethnic identities, closure within ourselves. It seems as of the political will to reform the United Nations and the European Community to tackle the global challenges on a new basis is missing. What strikes us the most is that, in a very cheerful and seemingly unaware way, many embrace the idea of an enemy from whom to defend themselves and closure within their own identity as solutions to all problems. The culture of enmity resurfaces among those who believe that we need to rebel against any international pact and suggest to put the interests of their own countries first. Let’s think of the slogans “American First” by Trump”, or “Italians first” by Salvini, or the Poles or the Hungarians of Kazynski and Orban first, or the threats against Iran or all the fundamentalists in the Middle East. All this is recounted euphorically but can soon become the premise to new, dangerous conflicts worldwide. People start from insults, the politicians’ threats on the social networks, and words which evoke a score-settling, but all this can degenerate overnight into an uncontrollable force beyond human control. It is the war’s ipseity, as explained Sylvain Tesson in his book A summer with Homer. When warfare takes on its shape from the spark of a fuse ignited by uncontrollable urges, it assumes a life of its own, as people do, and human beings then become captivated and conditioned by it. At this point, people feel compelled to fight. Then it becomes very hard to choose. When the mechanism of war is unleashed, it is already too late. It happened for the Troy war when the Homeric heroes hesitated to fight, but then we're all drawn into it. Confrontation is thus presented as a redemptive action by Steve Bannon, the most important theorist of the new brands of nationalism, who dreams of a world regeneration through the country’s rebellion against the supranational powers. This is like saying that there have to be wars to build new world orders. The populist international that people like him would like to found in Brussels is a contradiction in terms because over history we have never seen any solidarity between the various brands of nationalism: nationalism lives only in the clash with the others. Those who fan the fires of hate and hatred are not able to keep them in check. The culture of the enemy today has taken deep roots around the issue of migrants. They are presented not like a varied plurality of men and women having different opinions and backgrounds, but as a uniform mass made of slackers who would like to live at our expenses and are imbued with a culture antagonist to others, wishing to contaminate us by bringing the Sharia law into Europe. Muslims are indicated by some forces as our most dangerous enemies, from whom we should defend ourselves. Not only those forces are not willing to work o a possible interaction with them based on democratic values, but those who exploit the fear aroused by their presence take up no responsibility for the economic development of Africa, nor are interested in helping the Arab and African countries to choose a democratic path, but are only concerned about erecting policing fences at our borders to prevent the escape of those who fight for survival. A blatant example of such an indifference toward human rights in the world comes to us from the heinous murder of journalist Jamal Khashoggi. President Trump said that the issue of human rights in Saudi Arabia (including the most gruesome assassination) played a minor role if compared to the United States economic interests to him. Who cares, said the US President, if there is a bloody dictator and there are human beings who suffer because of him if that country does business with us and is our ally. The US President is not the only one to think this way. The various brands of sovereignism diminish the citizens’ responsibility for taking part in world events. Pope Francis has coined a great expression for this: globalization of indifference. Our society seems to fall short of an ideal urge to prevent genocide, solve conflicts and stop the wars. Syria and Yemen are only some of the many examples of an escape from responsibility on the side of the international community. And our country, involved in a work of pushback of the migrants, is totally absent from the international scene. The culture of enmity does not only oppose a nation to another (as it happens for example in Europe, where the French and the Germans are suddenly presented as the obstacles to our well-being) but affects the very democratic life. When some winners of the elections set themselves up as the absolute mouthpiece of the people, as Karl Popper reminded us, they deny that these people have a plurality of representations and seek an easy shortcut by bowing political life to one single opinion. Hence stem the attacks against the press, the intermediate bodies of the state, the bench, the bodies of representative democracy, and the very President of the Republic. All those who fail to represent their electorate are seen as troublemakers and cumbersome people. Those who express different opinions are considered as enemies and bringers of conspiracies. In some politicians’ opinion, the consensus of the network even becomes more important than the checks and balances of the representative institutions. The social networks and likes are the new Soviet, the true expressions of the people’s will, while the Parliament and the European institutions represent an obstacle. Today there are some people, like Orban, who have no restraint in talking about the legitimacy of illiberal democracy. What happened in Hungary, Poland, and tragically in Turkey, could repeat itself also in our country. What though strikes us the most about the speeches aimed at summoning the audiences against the new enemies, is that this all is made in the name of the exercise of freedom. We could use a new definition: a new Enlightenment turned inside-out and upside-down. We see it in the social media and the Net. Thus there are people who feel entitled to speak about everything, to take a stand without any knowledge, to point for public contempt at those whom they come, time after time, to consider as enemies of their own way of thinking. They feel so omnipotent and bringers of an absolute truth while instead, it is only about their truth. Kant, as philosopher Rocco Ronchi reminded us, had summoned the individuals to get out of their minority status and use reason without any authority to decide for them. The philosopher sought to praise the individual’s personal responsibility, who thus was no more a minor and would eventually become a grown-up man. Today, though, a distorted concept of responsibility has emerged in the Net. Those who express themselves in a certain way, fail to recognize their own humility and limits but think they can express a unilateral view of just everything: from science to medicine, from politics to economics. They do not realize that when they participate in the discussions they bear a great deal of responsibility, as the network mechanisms might amplify an incorrect thought and even a lie. Thus they can do harm for an improper use of their freedom. But it’s not only this. Those who feel superior to any scientist, philosopher or engineer, by necessity do not seek dialogue and peaceful debate but leans towards stigmatizing anyone who has different opinions. This is one of the typical ways, in which the culture of the enemy affirms itself. Not by chance, in the network, we often find small tribes of people who love crusading and silencing the bringers of different opinions. The exercise of freedom thus becomes an apprenticeship to hatred. Exactly the opposite as Kant’s construction, one which envisioned the individual freedom of a responsible and grown man. Nowadays, though, not only know-it-alls circulate on the Internet, but also true professionals who use a sophisticated technique to spread fake news and thus foster hatred. We are all summoned to isolate them because their effect is felt in society and conditions the people’s behaviour. What can we do then, to counter hatred, indifference and the culture of enmity? I strongly believe that the Gardens of the Righteous, which first of all have an educational role, can propose to the schools and administrations new practices and exemplary behaviours. They can thus sow and create a mechanism of positive emulation in society. As Socrates taught, the Good is nurture and helped spread when there are men who practice it. First of all, through the Gardens of the Righteous, we can teach the younger people that our world is a common homeland and can survive only thanks to active cooperation. We need to explain that we are all connected to each other through the social network, communications, but, as Agnes Heller points out, we are unable to live with a cosmopolitan responsibility. We can navigate over the Internet and learn live about any event happening anywhere in the world, but we do not care. We are blatantly failing in front of the impending climate change. We are the generation, which every day sees the first effect of global warming and we run the risk of being the generation that will go down to history for doing nothing to avert historic catastrophes, like the previous one which did not avert the genocide against the Jews, when it was still in time. This is why we should add to the Gardens the theme of the Righteous for the environment, which we could call as the Righteous for the rescue of the planet. The impending danger, paradoxically, could urge us all to find again our sense of belonging to a single nature. After all, the word “cosmopolitan” in ancient times bore precisely this meaning. We all belong to the same nature and the same cosmos, no matter whether we live in Rome, New York, Paris or Jerusalem. Probably, if we are aware of this challenge, we could defy the constraints of nationalism and the mechanisms of hatred. What is the sense in the divisions, in the face of a danger that threatens us all? How could I be against the French, the Germans, the Israelis, the Russians, the Americans, if in order to face climate change, we must build a common international front? I come to think of great science fiction movies such as Independence day or Deep Impact, where the humanity unites in front of a global threat. The Gardens of the Righteous not only can spread the knowledge of the best people committed to the defence of the planet but also trigger new behaviours among the young people for the preservation of the environment. As artist and photographer Anne de Carbuccia suggests, we should, first of all, popularize in schools and the society the studies of the major scientists on climate change, and then, for example, educate people not to use the plastic bottles, which end up into the ocean, anymore, or also support the enterprises and people who adopt a sustainable lifestyle. In order to fight the culture of hate and enmity, we must reappraise the importance of our common belonging to Europe and the founding values of this fate of ours, which go far beyond the very institutions. Living as Europeans above all means defending certain values: the openness to the others, the repudiation of war, the education to non-violence and the respect of plurality and human dignity, the defence of democracy and human rights for every woman and men in the world. If we move ahead with this spirit, we could regenerate the European Community and feel part of a horizon that goes beyond the nation we were born in. Seneca reminded us a key element for the education of the citizens, which should be still valuable for today’s Europe. Every one of us is a member of two communities: one which is really great and common, in which no boundaries exist, and the other is the one, which was assigned to us at the moment of our birth. It is this steady dialogue that gives Europe its strength. Those who today confront the nation with Europe and reject a sense of a greater belonging, forget the tragic history between the two world wars and lead us to new conflicts. This is why we should make people aware through our Gardens, about the Righteous people who have built Europe, from Altiero Spinelli to Simone Veil, Bronislaw Geremek and Lech Walesa. It is thanks to the courage of these people and their battles, that our generation has been, at least in Europe, luckier than others and has not experienced the trenches of wars, it has seen the dictatorships, the fascist and communist regimes fall, and has been able to travel freely across every country. We must bring about the European Righteous, who has worked for the reconciliation between nations that had waged war against each other or had committed the worst genocide cases against the minorities. I would like to remember, for instance, Willy Brandt who went down to his knees in the Warsaw ghetto in order to reconcile Germany with the Poles and the Jews after the heinous crimes committed by the Nazis in Poland, or Hungary’s Istvan Bibo, who in 1948 demanded the Hungarians to undertake a deep soul searching about their own responsibilities for the Holocaust, or Simone Veil in France, who after surviving Auschwitz saw in the European construction the most important antidote against national hatred and every urge leading to war. In order to give strength to this sense of European belonging, we think first of all the teaching of history and the knowledge of both the mechanisms that led to genocide, or totalitarianism and war and those which generated from negative experiences the urge to build Europe. 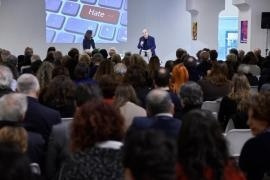 This is why we set out the goal of building with the Università Cattolica of Milan, a permanent centre for teacher training so that the Gardens of the Righteous become an instrument of study and further analysis at schools. We cannot tell about the Good only by sparking emotions: we need to always explain the historical context. The Gardens of the Righteous can become a unification factor and a bridge between different experiences in Europe in order to spread the knowledge about reference moral figures and to create synergies and cooperation for common battles for human rights. I imagine twinning programmes between the different Gardens of the European Community, student journeys to the discovery of the different Gardens of various towns, a contest at schools about Europe’s Righteous. I imagine that in a high school in Paris, London or Berlin, we can study and deepen the tales of the Righteous who are remembered in the Italian gardens and vice-versa. The research about the European Righteous can thus become a continuous training to European citizenship. Feeling European does not mean forgetting about our country’s call in a moment in which there are forces pushing for a confrontation with Europe and passing forward to the world a selfish and distorted image of Italy. Today, every one of us is called to choose. Do we want an open, sympathetic country that creates bridges in Europea in the rest of the world, or must we face a drift that will even put in doubt our best soul? The moral image of our country is in the hands of every citizen and Gariwo wants to give an important contribution in this sense. It is also on the basis of this identity element that we can fight the culture of hate and enmity. In our history, with the exception of the colonial time and the racist laws of the fascist regime, there has never been an ethnic identification of our nation, because we are the expression of dozens of different ethnicities that have integrated in our peninsula, as Giuliano Amato recalled. We are thus inclined to hospitality and openness toward the others. We are thus considered worldwide not only as a hospitable country but also as a country with a humanitarian soul that is always engaged in the reconciliation and conflict resolution. The others see us as the country of beauty, culture, the arts, architecture, but also as the country of Good and generosity. The most important wealth of a country in its international relations is its moral character. We lost it during fascism and its infamous racist laws, but today we are all summoned to proudly keep Italy’s best soul. This is why the pathway that Gariwo started with the Farnesina, and which we, along with the Italian embassies abroad, have defined as the “diplomacy of Good”, is so important. Italy is the European country that has been on the frontline in the proposal of the discourse about the Righteous, first by bringing the European Parliament to vote for the European Day of the Righteous and one year ago by approving in the past legislature the Day of the Righteous for the Humanity as a civil feast. Hence our country has become the engine to create Gardens of the Righteous at the international level in England, France, Germany, Greece, Bulgaria, Lebanon, Israel, Tunisia, Jordan, Armenia, Rwanda, Argentina and the United States. We can say that in all these countries, the Gardens of the Righteous have an Italian flavour. We have thus become world heralds not only of art and culture but also of the memory of the best people of humanity. This way we spread not only the knowledge of the beauty of the paintings by Botticelli, Leonardo, or Raffaello but also the tales of men and women like Armin Wegner, Giorgio Perlasca, Etty Hillesum, Milena Jesenska. Whereas Israel has been the first country to remember the Righteous, today Italy is becoming the great amplifier of this universal idea in the world. Which new good practices can we spread in society through the creation of the Gardens of the Righteous? How can the Gardens of the Righteous help break the chain of hatred and resentment and create behaviours that foster friendship and sharing? This is the most important challenge, to which all the schools and associations that have started this project with us in Italy and Europe are called. We must be aware of the fact that change possibly occurs in daily lif and in the concrete and common deeds of the people – as sociologist Zygmunt Bauman put it – and it was one of the reasons why he, at age 90, caught the bus and tram to move in town, to be able to listen to the people’s words – it is always is society that we have to sow the seeds, if we want to see some results in the upper layers. Institutions are transformed by people’s behaviour. This if the effect of what Havel and Patocka used to call, in Prague, as the power of the powerless, which could condition and modify the actual power. But, for this to happen, it takes a process of continuous education at the social level, and not a Jacobin imposition from above. Our first duty is to create community experiences surrounding the Gardens, which may make it possible to overcome stereotypes and prejudice not only in the population or among the migrants, but among the very religious and cultural minorities. I imagine that the Gardens can become places of encounter between believers of different faiths, break the equation according to which all Muslims are potential terrorists or Sharia law propaganda men, and also confront the anti-Jewish prejudice existing in the Muslim communities that do not recognize the right to existence of the state of Israel from the roots. Welcoming people is not enough, but it is also wrong to believe that the different people put together can enrich each other without any mediations in an automatic cross-fertilization process. If the first step is reciprocal knowledge (Socrates said in his dialogues he did not know, because he wanted to learn about the other first), the next step is to create common pathways in which everybody, by recognizing their common humanity, engage in taking up responsibility about the problems of our time – from women’s emancipation to the struggle against violence and terror, to the battle for peace. This is why we have put forward to invite in the Gardens of the Righteous the representatives of all religious communities (Muslims, Christians, Jews and Buddhists) and all the minorities that live in our country so that they can join us in spreading the message of the Righteous worldwide. The Gardens of the Righteous can thus become places of hospitality, sharing, and common experiences. Our second duty is that of creating, around the Gardens, an education movement able to stem the culture of contempt and enmity in the political debate and in the use of the social network. We would like citizens to watch and help to prevent, within their sphere of competence, the logics of insult and slurs from prevailing in public life. Every citizen, with an act of personal responsibility, should express his or her disapproval whenever a politician speaks with contempt, dehumanizes people, tells lies or presents those who think differently as enemies to crush. Everyone of us, regardless of his or her own political views, should feel engaged in reconstructing a Polis of friends who discuss politely, confront on the level of ideas and respect the other’s skills and knowledge. A true democracy works, when nobody feels he or she is the bringer of an absolute truth or appoints himself a single representative of the people’s will and when leaders, for the sake of good government, seek the cooperation of everybody. Today, though, citizens have a direct responsibility when expressing themselves on social media. Every word can have an immediate effect on society because once shared, it can be read by everyone. This is why it is important to teach how to dialogue with a taste for the respect of the others, not to let unverified information and news, and to accept without prejudice the discussion between holders of different opinions. The social media need to transform and become places of peaceful conversation, in Kant’s spirit, that may help knowledge and sharing, and should not work as arenas with clashing tribes in search for enemies. Why can the Gardens of the Righteous help spread a culture of dialogue and become an instrument for dialogue to stem hatred and the culture of the enemy? The reason lies in their genesis. The Gardens are the expressions of human plurality because they gather different stories and experiences and seek to teach new behaviours in the difficult and complex time we are living in today. We of Gariwo will try to gather and spread on our Website and through our network all those exemplary experiences which are headed for this direction.